They have the usual mujaddara made of rice and lentils, but they also carry a burghul and lentil variant. I was curious one day, so I ordered it. I was asked if I really I wanted the burghul one, because (apparently) it was a dish primarily ordered by their Middle Eastern customers. Well, I loved it... so much that I wanted to make it at home, so I went and bought whole wheat burghul (instead of the pale, de-branned type thanks to the advice of one of the customers of Mediterranean Market) and tried my hand at making burghul and lentils mujaddara. So, what does Exotic Bakeries have to do with Burghul Mufalfal? Not much, except that I have yet to satisfactorily recreate their burghul and lentil mujaddara, which leaves me with a container of burghul and a desire to cook with it. While skimming through my Middle Eastern cookbooks I found this recipe in From the Land of Figs and Olives where burghul is cooked with onions and a touch of beef, and simply spiced with salt and pepper. 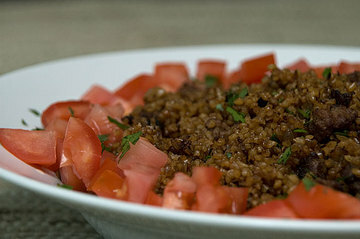 *burghul is also known as "bulgur"
In a frying pan, heat the oil and sauté the meat for 5 minutes. Add the onions and continue cooking, stirring from time to time, until the onions turn light brown. Stir in the burghul and stir-fry for about 3 minutes. Add salt and pepper and water. Bring to a boil, then turn the heat down to low and simmer for about 30 minutes, until all the water is absorbed. Put a close-fitting lid on the pan and turn off the heat. Let stand for about 15 minutes before serving. That sounds wonderful. Here's my recipe for mujaddara which is similar to but more rice heavy than exotic bakery's...which I agree is the best Syrian food in town. My family makes Burghul (we call it Bulgoor instead)for most holiday meals. It makes a wonderful pilaf: Brown 1 oz. broken angel hair and 1/4 C. pine nuts into in 5 T. butter. Add 1 C. Bulgur and coat it in the butter. Add 2 C. hot lamb or beef broth, 1/2 t. salt and 1/4 t. fresh pepper. I have been trying to recreate the same dish since eating a heavenly mjadara with bulghur in Beirut about three years ago. You can read about my attempt on here: http://jgs42.livejournal.com/7187.html. I was going to ask if it was the same as Bulgar...but I think another commenter answered that for me.